Began with v. 1, no. 1, Jan. 26, 1989. Description based on: Vol. 4, no. 29 (July 16, 1992). 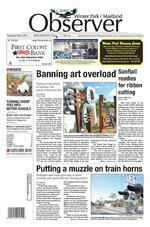 Page 2 | Thursday, Feb. 6, 2014 | Winter Park / Maitland Observer ART | Restrictive law aims to keep up prestige of city art shows TRAINS | Loud horns soon to be no more proximity, Commissioner Tom McMacken said. The illusion is that they are somehow tied in to what the two art festivals are sponsoring. Its an unfortunate practice, but it happens. Hope fully this will keep it from oc curring here in Winter Park. Winter Park residents spoke in favor of the non-compete periods. Resident Terrance Barter said cities includ ing Tampa, Ft. Lauderdale and Naples have ruined the market by overcrowding their art show sea sons with too many art events. The 30-day bans would help ensure a larger showing for Win ter Parks spring and fall art fes tivals, giving their artists a better said. If an artist were to come to the Winter Park show and be able to walk away with a thousand dol lars in their pocket, if you allow one of these shows, that artist will probably see maybe six hundred, Barter said. People that come and save money are not discrimi native. By the time they come to what the city is so proud of, theyve al ready spent their money. Winter Park artist Kathleen Brodeur said Winter Parks art festivals are something unique and special to Central Florida and should be preserved and protect ed. The Winter Park autumn and spring art festivals are two of the best shows in the coun try, said Brodeur, whose oil paint ings have been featured in both events. The Winter Park art festivals have a certain prestige and high reputation. Flooding the market with more shows especially from non-local promoters and or ganizations will hurt the exist ing shows and the artists. Mayor Ken Bradley suggested limiting the number of art events in the city altogether, but Brown advised otherwise. The blackout now and could serve as a good starting point for further regula tion, Brown said. throughout our community, Mayor Ken Bradley said. You dont have to live near a train track to hear the trains. I prob ably live as far from the train tracks as anybody in this city and on the nights we have our win dows open, you hear them every night. Now that we have a mechanism to potentially do it ourselves and a way to do it, its an exciting oppor tunity and its in our lap now. City Commissioners have pursued funding for a quiet zone project for the past eight years, City Manager Randy Knight said. An idea of a partnership with Maitland and Orlando to earn federal funding sprang up in the City Commission chamber back in August 2012, but never came to fruition. The awaited quiet zone project would not only make the area more livable, but much safer, Commissioner Steve Leary said. I wish they called them safety zones rather than quiet zones, Leary said. Ive seen cars coming up at intersections and get caught on the other side of the [railroad] gates. This kind of thing helps prevent that. Winter Parks resi dents have heard pass ing train whistles go by since the original OrlandoWinter Park Railroad opened in 1889, just two years after the original chartering of the city. The Dinky Line as Rollins College students called it carried pas sengers between the two cities for decades until it was shut down in 1969. The new quiet zones would be a natural evolution in the citys history, Bradley said. I think it would be a con tinuation of the citys position, Bradley said. Winter Park was founded around a train station. The train moving forward will obviously be a very important thing for those who come to our city and our residents. The creation of quiet zones will do nothing but make our city a better place. The city will immediately begin searching for an architect for the project, which should be completed by early 2015, Knight said. C ONTINUED FROM FRONT PAGE C ONTINUED FROM FRONT PAGE JANUARY 13 (Mon) Beginning Walk-Run Program Begins .................... Blue Jacket Park Presented by Track Shack Fitness Club 21 (Tue) MarathonFest Marathon Training Begins .................... Glenridge MS Presented by Track Shack Fitness Club 25 (Sat) Seasons 52 Park Avenue 5.2k* .................................. Park Avenue Presented by Florida HospitalFEBRUARY 1 (Sat) Florida Hospital Lady Track Shack 5k ......................... Mead Garden 15 (Sat) Run Around the Pines 5k* ...................................... Showalter Field Presented by Florida HospitalMARCH 15 (Sat) Zimmerman Kiser Sutcliffe Winter Park Road Race 10k & 2 Mile*Presented by Florida Hospital ................................ Park Avenue 24 (Mon) Beginning Walk-Run Program Begins .................... Blue Jacket Park Presented by Track Shack Fitness ClubAPRIL 26 (Sat) Run for the Trees 5k .............................................. Showalter FieldJULY 4 (Fri) Hunter Vision Watermelon 5k ..................................... Park Avenue Run, Walk, Train. Winter ParkFloridas premier fitness destination! An Afternoon of Music and Romance featuring Michael Andrew & SwingerheadConcert in Central Park n Afternoon of Music and Romance featurin Michael Andrew & Swin g erh e rnoon of Music and Romance featurin g Michael Andrew & S w i The Winter Park Art Festivals have a certain prestige and high reputation. Flooding the market with more shows especially from non-local promoters and organizations will hurt the existing shows and the artists. The creation of quiet zones will do nothing but make our city a better place. Winter Park / Maitland Observer | Thursday, Feb. 6, 2014 | Page 3 Maitland City Talk BY HOWARD SCHIEFERDECKER MAYOR Feb. 12 meeting on CRA Over the past 18 months, we ment interest in our CRA district. The majority of the interest is cen tered on our downtown core area. The downtown core area is a fourblock area bound by George Av enue to the north, U.S. Highway 17-92 to the east, Maitland Av enue to the west, and Packwood Avenue to the south. Horatio Av enue and Independence Lane are the main streets within this area where the redevelopment interest is focused. Presently, four development teams, in different stages in their due diligence process, are pre paring redevelopment proposals for submission to our city. These proposals will include some or all of the 2-and-a-half acres of cityowned property located within that core area, such as the old City Hall site and the parking lot on the north side of Horatio Avenue. However, before any develop ment team submits a proposal, our how our city property will be ad dressed as part of this redevelop ment. Therefore, the City Council and CRA Board have scheduled a joint special meeting on Feb. 12 at 6:30 p.m. in the City Hall Council Chambers to address two decision items as follows: 1. To consider a decision to include the city-owned parcels (including the old City Hall site and the north parking lot) in the redevelopment process for the core area; and, 2. To consider authorizing the publication of notice under FS 163-380 Disposition of Public Property to invite proposals development of the real property indicated above to be submitted 30 days from the date of publica tion of the notice. The second agenda item is a state statutory requirement as well as a mechanism to entice de velopment teams located outside of Central Florida to submit pro posals. This meeting on Feb. 12 is a very important one for our Mai tland community, and we need your input as the City Council and the CRA Board consider the items on the agenda. Please mark your calendars and plan to attend. Redeveloping downtown City National Bank is a full service commercial bank. We lent more than $1.75 billion during the last two years.Please visit any of our banking centers from Miami to Orlando or contact us at 1-800-435-8839. Business Term Loans Equipment/Inventory Financing Accounts Receivable Lending Capital Improvement Loans Professional Lines of Credit Small Business Lending Owner-Occupied Commercial Mortgages SBA Loans Residential Mortgages* Home Equity Lines of Credit* citynational.com Member FDIC* Loans are subject to credit and collateral approval. We are really lending We make business happen. 0106-3 CNreallyLndng.indd 1 1/10/14 11:19 AM 407-659-5701 www.TrustcoBank.com*Information based on current closings. Circumstances beyond Trustco Banks control may delay closing. Please n ote: W e r eser ve the right to alte r or w ithdraw these products or certain featu res thereof without prior notification.Member FDICEQUAL HOUSINGLENDER RYour Home Town Bank TRUSTCO BANKFast, Local Decisions Close your First Mortgage in 30 days! *Schedule Closing Date at Application Our loans close on time!Low Closing Costs No Points and No T ax Escrow required Trustco Mortgages We Close Loans! Page 2 Central Florida Senior FEBRUARY 2014 PUBLISHER Tracy Craft 407.515.2605 TCraft@TurnstileMediaGroup.com MANAGING EDITOR Isaac Babcock 407.563.7023 IBabcock@TurnstileMediaGroup.com ADVERTISING Linda Stern 407.376.2434 LStern@TurnstileMediaGroup.com ASSOCIATE EDITOR Sarah Wilson 407.563.7026 SWilson@TurnstileMediaGroup.com DESIGNER Tom Miller 407.563.7032 TMiller@TurnstileMediaGroup.com Published by Turnstile Media Group 1500 Park Center Drive Orlando, FL 32835-5705 P: 407.563.7000 F: 407.563.7099 Its TAX time. Appointments Available 7 Days a Week!Tax Form Processing LLC4070 Aloma Ave., Suite 1010 Winter Park, FL 32792Tel: (407) 657-6336www.TaxFormProcessing.com Proudly Serving the Orlando Area for 19 years! Scan QR Code 40$ 00OffTax PreparationMust present this coupon at time service is provided. Offer valid for one-time use. Cannot be combined with any other offer. Expires April 15, 2014Offer Code: CFS14 ASSISTED LIVING RESIDENCE 395 Alafaya Woods Blvd., Oviedo, FL 32765 407-977-8786ALF License No. 9235, 9308, 9307 www.slm.net/SCOviedo1 Signature property of Located on a beautiful campus setting, our two Savannah Court communities provide full assisted living services while Savannah Cottage offers a secured residence for those with memory loss. Call us today, stop by for a visit, join us for lunch, or all of the above! You are always welcome at Savannah Court and Cottage of Oviedo. MEMORY CARE RESIDENCEWhere hospitality is truly a way of life! Savannah Court and Cottage ASSISTED LIVING RESIDENCE 395 Alafaya Woods Blvd., Oviedo, FL 32765 407-977-8786ALF License No. 9235, 9308, 9307 www.slm.net/SCOviedo1 Signature property of Located on a beautiful campus setting, our two Savannah Court communities provide full assisted living services while Savannah Cottage offers a secured residence for those with memory loss. Call us today, stop by for a visit, join us for lunch, or all of the above! You are always welcome at Savannah Court and Cottage of Oviedo. MEMORY CARE RESIDENCEWhere hospitality is truly a way of life! Savannah Court and Cottage Located on a beautiful campus setting, our two Savannah Court communities provide full assisted living services while Savannah Cottage offers a secured residence for those with memory loss. You are always welcome at Savannah Court and Cottage of Oviedo www.savannahcourtoviedo.com395 Alafaya Woods Blvd., Oviedo, FL 32765407-977-8786 Call us today, stop by for a visit, join us for lunch, or all of the above! JACK | Waving now reserved for weekends, while during the week he enjoys Easter Seals senior programs are told in present tense as if theyd C ONTINUED FROM FRONT PAGE Please see JACK on page 3 PHOTO BY ISAAC BABCOCK CENTRAL FLORIDA SENIOR Goettel has gained fame as the man who waves to everybody, a rarity these days, says his daughter Linda. Page 3 Zounds aids are the product of 57 U.S. patents in acoustical engineering, utilizing proprietary technology that is unrivaled.Fully Rechargeable! Zounds will replace the rechargeable batteries FREE for the life of the aids:Superior technology thats truly aordable. Hearing Aids State of the art, advanced digital hearing aids:Reduces Background Noise Up to 90% No More Squeals or Whistling Full Spectrum Sound Individualized Live Speech Mapping Hear Clearer, More Naturally Remote Control Programmable FREE HEARING EXAM!Call your local Zounds Hearing Center for aManufacturer-Direct Pricing and Outstanding Customer Care FREE CHARGERand rechargeable remote control (1)Buy Direct and Save When you purchase a pair of Imprezo 20 Hearing Aids. Call Today and get a... Orlando1503 S. Orange Ave. Orlando, FL 32806(321) 236-5906www.ZoundsHearing.com NOW SERVING ORLANDO!2AIDS FOR THE PRICE OFONE*Special! *Two-for One pricing valid only on the purchase of a pair of Zounds Imprezo 20 hearing aids. (1)Limit one free charging station and remote control per customer. Present this ad at Zounds Hearing Center. Expires 2/28/14. Not valid with other oers. Void where prohibited. 2014 Zounds Hearing, Inc. FREE Rechargeable Remote Control and Charging Station when you buy a pair of Imprezo 20 hearing aids! 20 Channels Digital / Fully Programmable JACK | Lakemont Jack says theres a greater meaning behind his greeting wave than just the simple hello C ONTINUED FROM PAGE 2 PHOTO BY ISAAC BABCOCK CENTRAL FLORIDA SENIOR Goettel dances with Barbara, one of Easter Seals Day Breaks more energetic seniors. Page 8 Newest Technology Available in Altamonte Springs CenterTo Treat Age-old ProblemBy Robert Perez Special to Central Florida Senior Causes Heredity Lifestyle Weight Hormones Treatment Sclerotherapy Ambulatory Phlebectomy Closure Procedure Vein Stripping Dr. Vakili call 407-865-7091 www.centerveinvascular.com Dust mites can stir up allergies in humid climates DEAR DR. DONOHUE: Whats all this about dust mites? Do they carry dis ease? How do we kill them? A baseball bat? R.H. ANSWER: Dust mites are hardly visible; theyre smaller than the period at the end of this sentence. They dont transmit dis eases, but they can create trouble for those who are al lergic to them or their waste material. The mite skeleton and waste products can pro voke asthma, skin itching, eye itching, sneezing and dripping nose. Most people, however, live in blissful ignorance of the mites. They have no symptoms. Dust mites dont bite. They feed on dead skin cells, mostly cells that have fallen off the body. They dont enter the mouth. You really cant tell theyre around. They like living in bedrooms in mattresses and bedding, including blankets upholstered fur niture and carpets. They can take up life in stuffed ani mals. Allow only washable stuffed toys into a bedroom. They prefer a warm, humid environment, which can be used to evict them. Keep the bedroom cool and dry with a dehumidi dehydrate mites. Wash all bedding weekly, and vacu um mattresses and pillows. Encase them in coverings specially made from cotton, polyester or plastic. Mites dont disap pear overnight. The battle against them has to go on for months and months. If after all these measures a person still suffers allergic symptoms, visit an allergist for desensitization therapy. DEAR DR. DONOHUE: I read that more heart at tacks occur in winter than in summer. Why? If you dress warmly, does that protect you? N.C. ANSWER: Cold weather is a stress on the body and the heart. The heart has to work harder to keep the body warm by pumping more blood than it ordinar ily does. That extra effort is too much for hearts not in the best of shape. Dressing warmly lessens the risk. DEAR DR. DONOHUE: Both my sister and I take Synthroid. My doctor insists the morning, before I have had anything to eat. He also has told me not to eat for 30 to 60 minutes after taking the tablet. My sister didnt get any similar instructions. She takes hers at noon with lunch. Whos right? L.C. ANSWER: Its best to take Synthroid, the most popular thyroid hormone preparation, on an empty stomach and to wait at least 30 minutes before taking any food. I have to assume that your sisters doctor is checking her thyroid hor mone levels from time to time. If she has to increase her dose of the medicine because of low blood levels, then she should adopt your method of taking Synthroid. Dr. Donohue regrets that he is unable to answer individual letters, but he will incorporate them in his column whenever possible. Readers may write him or request an order form of available health newsletters at P.O. Box 536475, Orlando, FL 32853-6475. 2014 North America Synd. Inc. Page 2 | Thursday, Feb. 6, 2014 | Winter Park / Maitland Observer ART | Restrictive law aims to keep up prestige of city art showsTRAINS | Loud horns soon to be no moreproximity, Commissioner Tom McMacken said. The illusion is that they are somehow tied in to what the two art festivals are sponsoring. Its an unfortunate practice, but it happens. Hopefully this will keep it from oc curring here in Winter Park. Winter Park residents spoke in favor of the non-compete periods. Resident Terrance Barter said cities includ ing Tampa, Ft. Lauderdale and Naples have ruined the market by overcrowding their art show seasons with too many art events. The 30-day bans would help ensure a larger showing for Winter Parks spring and fall art festivals, giving their artists a better said. If an artist were to come to the Winter Park show and be able to walk away with a thousand dol lars in their pocket, if you allow one of these shows, that artist will probably see maybe six hundred, Barter said. People that come and save money are not discriminative. By the time they come to what the city is so proud of, theyve al ready spent their money. Winter Park artist Kathleen Brodeur said Winter Parks art festivals are something unique and special to Central Florida and should be preserved and protected. The Winter Park autumn and spring art festivals are two of the best shows in the coun try, said Brodeur, whose oil paintings have been featured in both events. The Winter Park art festivals have a certain prestige and high reputation. Flooding the market with more shows especially from non-local promoters and or ganizations will hurt the existing shows and the artists. Mayor Ken Bradley suggested limiting the number of art events in the city altogether, but Brown advised otherwise. The blackout now and could serve as a good starting point for further regulation, Brown said. throughout our community, Mayor Ken Bradley said. You dont have to live near a train track to hear the trains. I prob ably live as far from the train tracks as anybody in this city and on the nights we have our windows open, you hear them every night. Now that we have a mechanism to potentially do it ourselves and a way to do it, its an exciting oppor tunity and its in our lap now. City Commissioners have pursued funding for a quiet zone project for the past eight years, City Manager Randy Knight said. An idea of a partnership with Maitland and Orlando to earn federal funding sprang up in the City Commission chamber back in August 2012, but never came to fruition. The awaited quiet zone project would not only make the area more livable, but much safer, Commissioner Steve Leary said. I wish they called them safety zones rather than quiet zones, Leary said. Ive seen cars coming up at intersections and get caught on the other side of the [railroad] gates. This kind of thing helps prevent that. Winter Parks residents have heard passing train whistles go by since the original OrlandoWinter Park Railroad opened in 1889, just two years after the original chartering of the city. The Dinky Line as Rollins College students called it carried pas sengers between the two cities for decades until it was shut down in 1969. The new quiet zones would be a natural evolution in the citys history, Bradley said. I think it would be a continuation of the citys position, Bradley said. Winter Park was founded around a train station. The train moving forward will obviously be a very important thing for those who come to our city and our residents. The creation of quiet zones will do nothing but make our city a better place. The city will immediately begin searching for an architect for the project, which should be completed by early 2015, Knight said. CONTINUED FROM FRONT PAGE CONTINUED FROM FRONT PAGE JANUARY 13 (Mon) Beginning Walk-Run Program Begins ....................Blue Jacket Park Presented by Track Shack Fitness Club 21 (Tue) MarathonFest Marathon Training Begins ....................Glenridge MS Presented by Track Shack Fitness Club 25 (Sat) Seasons 52 Park Avenue 5.2k* ..................................Park Avenue Presented by Florida HospitalFEBRUARY 1 (Sat) Florida Hospital Lady Track Shack 5k .........................Mead Garden 15 (Sat) Run Around the Pines 5k* ......................................Showalter Field Presented by Florida HospitalMARCH 15 (Sat) Zimmerman Kiser Sutcliffe Winter Park Road Race 10k & 2 Mile*Presented by Florida Hospital ................................Park Avenue 24 (Mon) Beginning Walk-Run Program Begins ....................Blue Jacket Park Presented by Track Shack Fitness ClubAPRIL 26 (Sat) Run for the Trees 5k ..............................................Showalter FieldJULY 4 (Fri) Hunter Vision Watermelon 5k .....................................Park Avenue Run, Walk, Train. Winter ParkFloridas premier fitness destination! An Afternoon of Music and Romance featuring Michael Andrew & SwingerheadConcert in Central Park n Afternoon of Music and Romance featurin Michael Andrew & Swin g erh e rnoon of Music and Romance featurin g Michael Andrew & S w i The Winter Park Art Festivals have a certain prestige and high reputation. Flooding the market with more shows especially from non-local promoters and organizations will hurt the existing shows and the artists.The creation of quiet zones will do nothing but make our city a better place. Winter Park / Maitland Observer | Thursday, Feb. 6, 2014 | Page 3 Maitland City TalkBY HOWARD SCHIEFERDECKER MAYOR Feb. 12 meeting on CRAOver the past 18 months, we ment interest in our CRA district. The majority of the interest is cen tered on our downtown core area. The downtown core area is a fourblock area bound by George Av enue to the north, U.S. Highway 17-92 to the east, Maitland Avenue to the west, and Packwood Avenue to the south. Horatio Av enue and Independence Lane are the main streets within this area where the redevelopment interest is focused. Presently, four development teams, in different stages in their due diligence process, are preparing redevelopment proposals for submission to our city. These proposals will include some or all of the 2-and-a-half acres of cityowned property located within that core area, such as the old City Hall site and the parking lot on the north side of Horatio Avenue. However, before any develop ment team submits a proposal, our how our city property will be ad dressed as part of this redevelop ment. Therefore, the City Council and CRA Board have scheduled a joint special meeting on Feb. 12 at 6:30 p.m. in the City Hall Council Chambers to address two decision items as follows: 1. To consider a decision to include the city-owned parcels (including the old City Hall site and the north parking lot) in the redevelopment process for the core area; and, 2. To consider authorizing the publication of notice under FS 163-380 Disposition of Public Property to invite proposals development of the real property indicated above to be submitted 30 days from the date of publica tion of the notice. The second agenda item is a state statutory requirement as well as a mechanism to entice de velopment teams located outside of Central Florida to submit proposals. This meeting on Feb. 12 is a very important one for our Maitland community, and we need your input as the City Council and the CRA Board consider the items on the agenda. Please mark your calendars and plan to attend.Redeveloping downtown City National Bank is a full service commercial bank. We lent more than $1.75 billion during the last two years.Please visit any of our banking centers from Miami to Orlando or contact us at 1-800-435-8839. Business Term Loans Equipment/Inventory Financing Accounts Receivable Lending Capital Improvement Loans Professional Lines of Credit Small Business Lending Owner-Occupied Commercial Mortgages SBA Loans Residential Mortgages* Home Equity Lines of Credit* citynational.com Member FDIC* Loans are subject to credit and collateral approval. We are really lending We make business happen. 0106-3 CNreallyLndng.indd 1 1/10/14 11:19 AM 407-659-5701 www.TrustcoBank.com*Information based on current closings. Circumstances beyond Trustco Banks control may delay closing. Please note: We reserve the right to alter or withdraw these products or certain features thereof without prior notification.Member FDICEQUAL HOUSINGLENDER RYour Home Town Bank TRUSTCO BANKFast, Local Decisions Close your First Mortgage in 30 days! *Schedule Closing Date at Application Our loans close on time!Low Closing Costs No Points and No Tax Escrow required Trustco Mortgages We Close Loans! Page 2 Central Florida SeniorFEBRUARY 2014PUBLISHER Tracy Craft 407.515.2605 TCraft@TurnstileMediaGroup.com MANAGING EDITOR Isaac Babcock 407.563.7023 IBabcock@TurnstileMediaGroup.com ADVERTISING Linda Stern 407.376.2434 LStern@TurnstileMediaGroup.com ASSOCIATE EDITOR Sarah Wilson 407.563.7026 SWilson@TurnstileMediaGroup.com DESIGNER Tom Miller 407.563.7032 TMiller@TurnstileMediaGroup.com Published by Turnstile Media Group 1500 Park Center Drive Orlando, FL 32835-5705 P: 407.563.7000 F: 407.563.7099 Its TAX time. Appointments Available 7 Days a Week!Tax Form Processing LLC4070 Aloma Ave., Suite 1010 Winter Park, FL 32792Tel: (407) 657-6336www.TaxFormProcessing.com Proudly Serving the Orlando Area for 19 years! Scan QR Code 40$00OffTax PreparationMust present this coupon at time service is provided. Offer valid for one-time use. Cannot be combined with any other offer. Expires April 15, 2014Offer Code: CFS14 ASSISTED LIVING RESIDENCE 395 Alafaya Woods Blvd., Oviedo, FL 32765 407-977-8786ALF License No. 9235, 9308, 9307 www.slm.net/SCOviedo1 Signature property of Located on a beautiful campus setting, our two Savannah Court communities provide full assisted living services while Savannah Cottage offers a secured residence for those with memory loss. Call us today, stop by for a visit, join us for lunch, or all of the above! You are always welcome at Savannah Court and Cottage of Oviedo. MEMORY CARE RESIDENCEWhere hospitality is truly a way of life! Savannah Court and Cottage ASSISTED LIVING RESIDENCE 395 Alafaya Woods Blvd., Oviedo, FL 32765 407-977-8786ALF License No. 9235, 9308, 9307 www.slm.net/SCOviedo1 Signature property of Located on a beautiful campus setting, our two Savannah Court communities provide full assisted living services while Savannah Cottage offers a secured residence for those with memory loss. Call us today, stop by for a visit, join us for lunch, or all of the above! You are always welcome at Savannah Court and Cottage of Oviedo. MEMORY CARE RESIDENCEWhere hospitality is truly a way of life! Savannah Court and Cottage Located on a beautiful campus setting, our two Savannah Court communities provide full assisted living services while Savannah Cottage offers a secured residence for those with memory loss. You are always welcome at Savannah Court and Cottage of Oviedo www.savannahcourtoviedo.com395 Alafaya Woods Blvd., Oviedo, FL 32765407-977-8786 Call us today, stop by for a visit, join us for lunch, or all of the above! JACK | Waving now reserved for weekends, while during the week he enjoys Easter Seals senior programs are told in present tense as if theyd CONTINUED FROM FRONT PAGE Please see JACK on page 3 PHOTO BY ISAAC BABCOCK CENTRAL FLORIDA SENIORGoettel has gained fame as the man who waves to everybody, a rarity these days, says his daughter Linda. Page 3 Zounds aids are the product of 57 U.S. patents in acoustical engineering, utilizing proprietary technology that is unrivaled.Fully Rechargeable! Zounds will replace the rechargeable batteries FREE for the life of the aids:Superior technology thats truly aordable. Hearing Aids State of the art, advanced digital hearing aids:Reduces Background Noise Up to 90% No More Squeals or Whistling Full Spectrum Sound Individualized Live Speech Mapping Hear Clearer, More Naturally Remote Control Programmable FREE HEARING EXAM!Call your local Zounds Hearing Center for aManufacturer-Direct Pricing and Outstanding Customer Care FREE CHARGERand rechargeable remote control (1)Buy Direct and Save When you purchase a pair of Imprezo 20 Hearing Aids. Call Today and get a... Orlando1503 S. Orange Ave. Orlando, FL 32806(321) 236-5906www.ZoundsHearing.com NOW SERVING ORLANDO!2AIDS FOR THE PRICE OFONE*Special! *Two-for One pricing valid only on the purchase of a pair of Zounds Imprezo 20 hearing aids. (1)Limit one free charging station and remote control per customer. Present this ad at Zounds Hearing Center. Expires 2/28/14. Not valid with other oers. Void where prohibited. 2014 Zounds Hearing, Inc. FREE Rechargeable Remote Control and Charging Station when you buy a pair of Imprezo 20 hearing aids! 20 Channels Digital / Fully Programmable JACK | Lakemont Jack says theres a greater meaning behind his greeting wave than just the simple hello CONTINUED FROM PAGE 2 PHOTO BY ISAAC BABCOCK CENTRAL FLORIDA SENIORGoettel dances with Barbara, one of Easter Seals Day Breaks more energetic seniors. Page 8 Newest Technology Available in Altamonte Springs CenterTo Treat Age-old ProblemBy Robert Perez Special to Central Florida Senior Causes Heredity Lifestyle Weight Hormones Treatment Sclerotherapy Ambulatory Phlebectomy Closure Procedure Vein Stripping Dr. Vakili call 407-865-7091 www.centerveinvascular.com Dust mites can stir up allergies in humid climates DEAR DR. DONOHUE: Whats all this about dust mites? Do they carry disease? How do we kill them? A baseball bat? R.H. ANSWER: Dust mites are hardly visible; theyre smaller than the period at the end of this sentence. They dont transmit dis eases, but they can create trouble for those who are allergic to them or their waste material. The mite skeleton and waste products can pro voke asthma, skin itching, eye itching, sneezing and dripping nose. Most people, however, live in blissful ignorance of the mites. They have no symptoms. Dust mites dont bite. They feed on dead skin cells, mostly cells that have fallen off the body. They dont enter the mouth. You really cant tell theyre around. They like living in bedrooms in mattresses and bedding, including blankets upholstered fur niture and carpets. They can take up life in stuffed animals. Allow only washable stuffed toys into a bedroom. They prefer a warm, humid environment, which can be used to evict them. Keep the bedroom cool and dry with a dehumididehydrate mites. Wash all bedding weekly, and vacu um mattresses and pillows. Encase them in coverings specially made from cotton, polyester or plastic. Mites dont disap pear overnight. The battle against them has to go on for months and months. If after all these measures a person still suffers allergic symptoms, visit an allergist for desensitization therapy. DEAR DR. DONOHUE: I read that more heart at tacks occur in winter than in summer. Why? If you dress warmly, does that protect you? N.C. ANSWER: Cold weather is a stress on the body and the heart. The heart has to work harder to keep the body warm by pumping more blood than it ordinar ily does. That extra effort is too much for hearts not in the best of shape. Dressing warmly lessens the risk. DEAR DR. DONOHUE: Both my sister and I take Synthroid. My doctor insists the morning, before I have had anything to eat. He also has told me not to eat for 30 to 60 minutes after taking the tablet. My sister didnt get any similar instructions. She takes hers at noon with lunch. Whos right? L.C. ANSWER: Its best to take Synthroid, the most popular thyroid hormone preparation, on an empty stomach and to wait at least 30 minutes before taking any food. I have to assume that your sisters doctor is checking her thyroid hor mone levels from time to time. If she has to increase her dose of the medicine because of low blood levels, then she should adopt your method of taking Synthroid. Dr. Donohue regrets that he is unable to answer individual letters, but he will incorporate them in his column whenever possible. Readers may write him or request an order form of available health newsletters at P.O. Box 536475, Orlando, FL 32853-6475. 2014 North America Synd. Inc.